Charge your daily activities with healthy low carb protein bars. 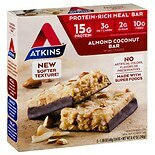 Atkins Advantage snack bars are wonderful meal replacement snacks available in many popular flavors, including strawberry-almond, cookies n cream, peanut butter, cinnamon bun, and chocolate chip. Choose from Atkins' four categories of low carb protein bars: carmel, original, morning and granola. Atkins bars are sweet, contain no sugar alcohols and have a low glycemic index. Atkins makes a variety of nutritional meal replacement bars, energy drinks and shakes for active men and women. Meal replacement plans are a great way to lose weight or watch your daily calorie intake. Replace only two meals, generally breakfast and lunch, and then have a healthy 600-calorie meal for dinner. Boost your energy level even more with XS Energy Drink, a low carb and sugar free energy drink mixed with herbs, B-vitamins and amino acids.